A friend up the road rang us on Wednesday morning. They were on their way somewhere for a few days, and had a cherry tree that needed to be harvested. Did we want some cherries? Silly question. 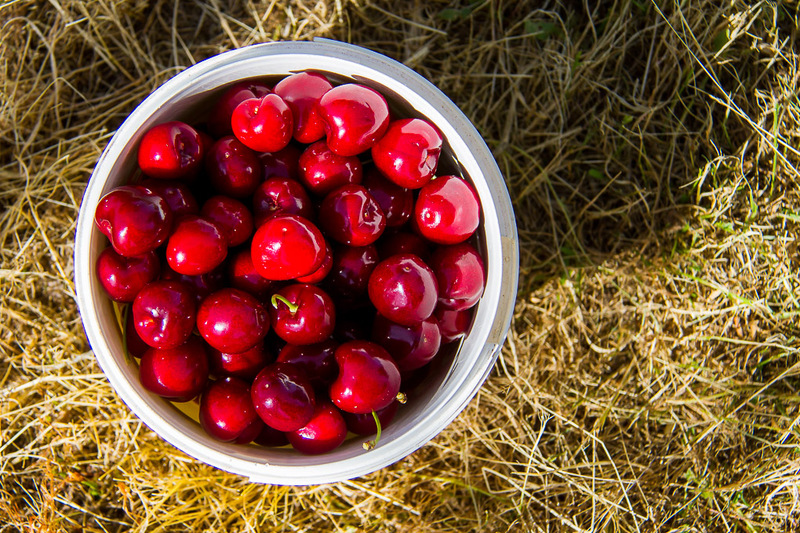 So on Wednesday afternoon we spent a lovely hour picking the juiciest, sweetest cherries. There were lots of ants on the tree, eating the damaged fruit, so the girls soon stopped after a few nips. 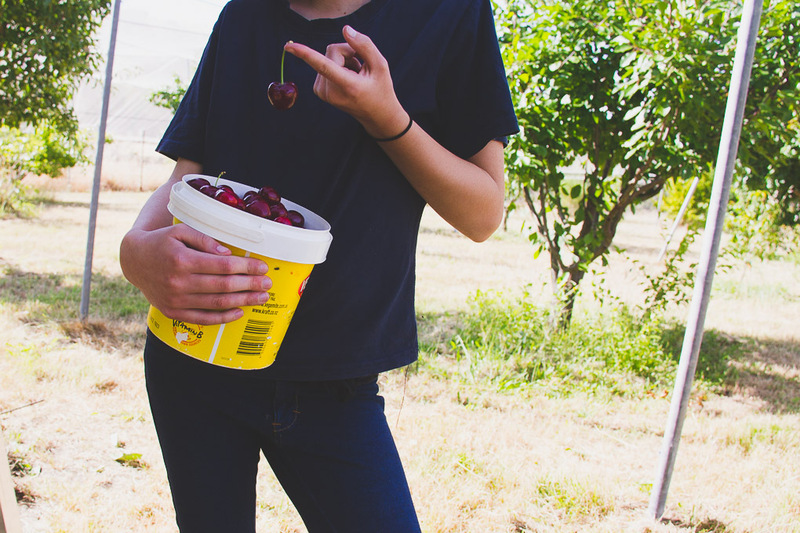 Toby, Country Boy, and I persevered and were rewarded with several small buckets of cherries. They were so shiny I could see my reflection. We’re getting excited about Christmas cooking. Now that December has hit, the girls and I are planning what we want to bake and make. 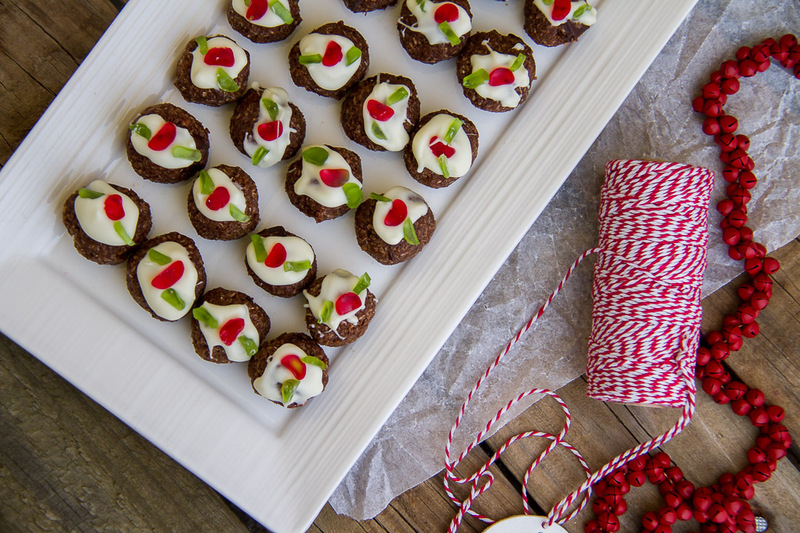 Meg had been talking about using her choc mint Weetbix slice recipe, but rolling it into balls, drizzling with white chocolate, and topping with a little bit of cut up jelly snake, so that they resemble mini Christmas puddings. She made a batch for church last Sunday and did a fab job too. They look super cute. She is planning on making them again to take to the village Christmas carols in a few weeks time. 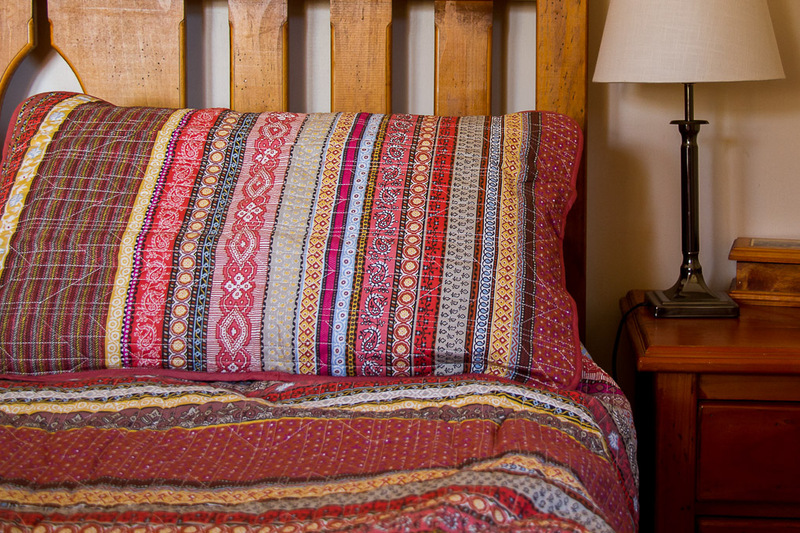 I had been eyeing off a new quilt cover for the past year. Country Boy obviously pays close attention, because look at what he gave me for my birthday. Loving it! Toby is off to big school next year. Although I can see that he is ready to go, I’m not ready for him to go. When we arrived here on the farm, he couldn’t even walk, and now he is running, climbing, riding bikes, and all manner of other things. Yesterday morning, he rode up to the gate with the girls where they catch the bus each morning, and then rode back again. 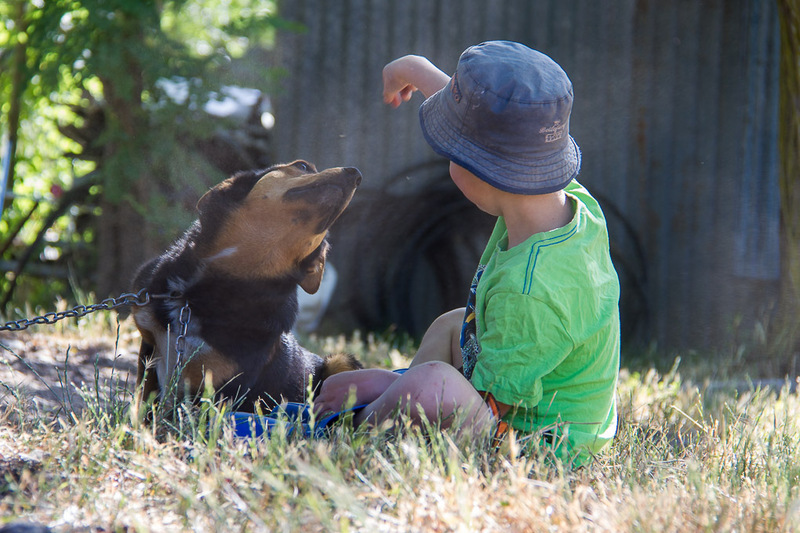 He then stopped and sat down to play with Jazz the dog. Love this pic that Country Boy snapped. We had a super late frost last week. It has been much discussed around these parts (as all weather is), and it is widely agreed that it was one of the latest on record. We thought that the fruit trees in the orchard had survived unscathed, but in the last few days, most of the nectarines have shriveled and fallen off the tree, so it looks like our harvest has been cut short – insert sad face here. I’ve just about finished my Christmas shopping – just a few purchases online to go (check out my country Christmas gift guide here). We have guests for the weekend, so have held off on decorating the tree until next week. The kids are itching to get it up and decorated. I may be looking forward to it too. What has been happening around your place lately? Have you got your tree up? Did you get that big frost? Those cherries look great. I make the most of them and treat myself each year as the season is so short. I saw a great sour cherry cake recipe the other day and meant to pass it on to you as you have a tree of them looking well loaded with fruit. I didn’t do it and now have no idea whe it was. Perhaps an idea for you, along with sour cherry jam. My son likes them in a strudel. Do you have any troublewith deliveriesfrom online shopping? I have had so many problems with PO Couriers that I have had to find ways around having stuff delivered here. I have hip and ligament problems and really find walking hard, so online shopping is perfect for me. Except for courier. Couriers don’t come out here, but they do drop to a shop in town, where you can pick it up from. Our mail is a bit hit and miss at times though. We have sour cherries, but need a sweet cherry tree now! Pottering here and watering. Last week of kinder and swimming and all those sorts of routine things. I do have a few social events which is great but Im feeling a bit guilty as Im going alone and cam is babysitting. Party guilt, who would have thought!!! ha ha!! It sure did get cold here , but no frost to report thankfully with all the grapes growing in the vineyard. Though I did notice a few apples on the ground so maybe the cold got them and they were confused with the weather going on. I was thinking it was the kids that pulled them off, though I havent ruled it out. Gosh, I can’t even fathom baking and xmas cooking yet, I have to get cracking on the shopping which I am actually looking fwd to. The decorations will be happening next week. We have people looking through the house first and I think it’ll look better without bunting, lights and reindeers everywhere. Doesn’t bunting make everything look better??? ?